MyWindowsClub.com is a new website launched from the famous DotNetSpider.com. This website provides a room for discussion on most of the major technologies. Even SQL server is also included for the discussion. This site has many other good features apart from technical discussions. To know more visit http://www.mywindowsclub.com and to start discussion on SQL Server related topics visit http://www.mywindowsclub.com/forum/Category44.aspx. To register to this site click here. This happens when user ‘NT AUTHORITY\SYSTEM’ local group does not have access to SQL Server and some service is trying to access SQL Server using this account. 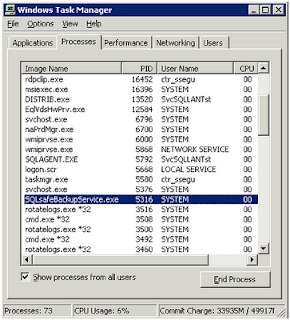 To Trace out which services is causing this issue, first you will have to run the profiler. We do not require all the events, so we can apply the filter for profiler to capture only “Audit Login Failed” event class. With this data we can conclude that it is coming from SQLsafe application. But from which process this is coming? 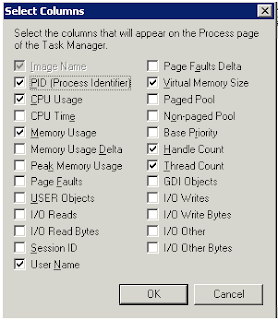 For this now we have to check the ClientProcessID column in the profiler results i.e. 5316 from the profiler results. Now if we go to “services.msc” and check for the logon account of this service we see that this is running under “Local System” account. 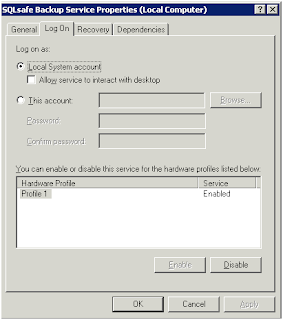 Once the Logon account is changed to some service account which has access to SQL Server, then the error stops.